Learn to fly fish with our licensed professional coaches who will give you a great fly fishing experience in Surrey. Our coaching is planned to help you achieve your goals and safely have fun in the beautiful Surrey countryside. Whichever of our destinations you choose, when you learn to fly fish with us you will receive best practice coaching and guiding. We adapt our courses to meet your needs and conditions on the day, and tailor the content to the species we are targeting. To help you learn to fly fish effectively we will show you how to select and assemble the equipment, cast and catch your fish. Personal tuition in fly fishing in Surrey will give you an understanding of what the target species feed on, and how to select and fish appropriate flies that will appeal to them. Gaining an understanding of the ecosystem is an essential part of learning to fly fish, understanding the behaviour of what the fish are feeding on helps us choose the right flies to use on our guided days. Depending on the species, destination and season we might be imitating a small fish, or a fly blown onto the water or an insect hatching in the surface film. Our fly fishing lessons in Surrey cover watercraft – how to read the water and understand the effect of temperature, wind and light on the behaviour of the target fish. We Fly Fish offers great trout fishing in Surrey. We match our fishing tactics to the seasons and imitate insects and small fish that are primary food sources for the trout at the time. This can vary during the day, when a hatch of aquatic flies can bring the trout to the surface looking for an easy meal. Spring to autumn brings the best dry fly trout fishing in Surrey fishing, and some of our waters hold the Mayfly whose hatch in May to June is often seen as the highlight of the season. In the winter, trout often feed on small fish fry, attacking the shoals and providing great sport on flies imitating escaping or injured fry. 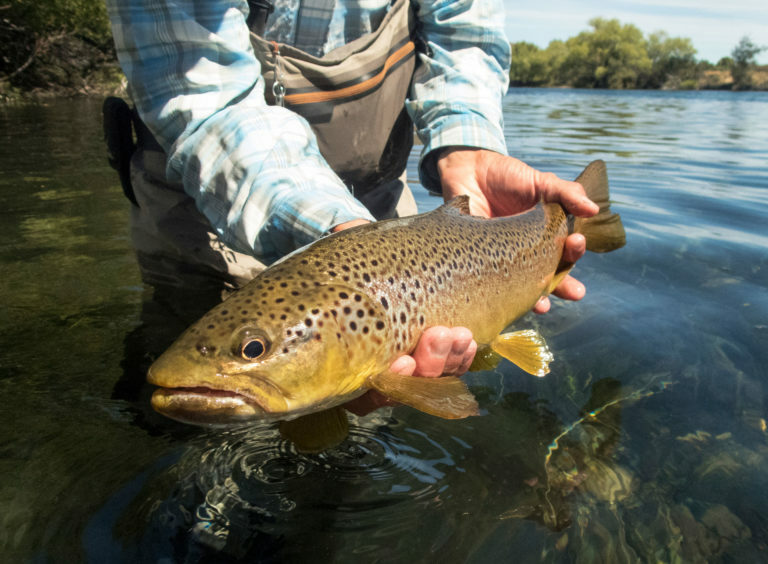 Successful trout fishing in Surrey requires understanding the natural environment in which they live, and ‘matching the hatch’ to select and present an appropriate fly. Carp can grow to large sizes in the waters we fish in Surrey, and we regularly catch fish over 10 pounds on the fly, enormous fun on a single handed fly rod. Carp much larger than this are present, into the 20 pound or even 30 pound class. Tackle is stepped up to deal with these hard fighting fish. We fly fish for carp in Surrey using dry and wet flies to imitate the insects they find naturally. Daddy long legs, sedge, and damsel flies can all work well. We also use flies that look like bread or even dog biscuits. Carp fishing in Surrey takes skill as they are very wary fish. That said, with accurate and stealthy presentation you can persuade them to take a fly. Hang on for a terrific scrap when they do! Fly fishing for carp is always ‘catch and release’. Pike fishing in Surrey regularly produces fish over 10 pounds on the fly, enormous fun on a single handed fly rod. Pike much larger than this are present, into the 20 pound or even 30 pound class. Tackle is stepped up to deal with these hard fighting fish which routinely run you into the backing. 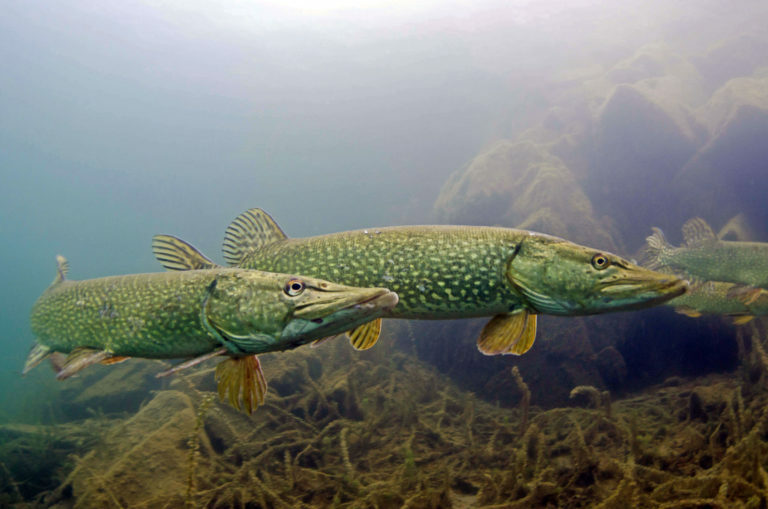 Pike are ambush predators typically waiting near cover to pounce on fish and other prey that come into range. We go pike fishing for pike in Surrey using surface ‘popper’ flies and sunken fish imitation flies. Expect exciting explosive takes and fast runs when pike fishing in Surrey! Our fly fishing for pike is always ‘catch and release’.